Domo Baal is delighted to present The Rural College of Art, a solo exhibition by David Gates. The making of an exhibition, of course, represents a formalised concern with presenting artistic practice. Gates until now has more frequently opted for an exhibition model that prioritises interventions over formal exhibition strategies, installing work (by invitation naturally) in man–made structures, often but not always semi–permanent, open–air structures and places of social interaction. Examples have included a G.P.O. telephone box, a bird–hide, a bookshop in Paris, a railway station in Essex, The Royal Mail Ltd and more recently a square igloo (a frozen white cube it could be said). The point being that just as Gates' practice is concerned with the borderline tension between that which is visible and that which is less so, The Rural College of Art as an exhibition seeks at all times to stay fiercely true to its origins and sensibility while offering a more generous degree of comfort and accessibiity to its audience (on this occasion). This Spring, Berlin Gallery Weekend will see David Gates of The Rural College of Art install a full exhibition to include animation and new work in a private space at Mehringdamm 72, Kreuzberg – visitors will be welcomed to visit the installation one at a time by climbing a ladder (wooden of course). David Gates is an image catcher retrieving and fixing images, sometimes this happens using pinhole photography, and sometimes through collage. He also works with leaves, feathers and bark. His primary tool is pinhole photography directly onto silver gelatin on bitumen on cardboard. Resolutely eschewing the sublime and stubbornly unromantic he reduces and edits grand landscapes, 300 year old trees in the landscape of coastal Essex where he lives to the semblance of a mugshot. Bleak holiday houses on the Thames estuary remain bleak and shuttered even when occupied. People–free images offer a world shaped by individuals and people mostly long gone and unknown who have planted and planned and built to fulfill their dreams. Ancient oaks forests and sullen bungalows all stand silently to attention as if bearing witness to an unseen happening. David Gates lives and works in Essex, for Gates pinhole images, far from being nostalgic, authenticate the present, making it vibrant and shimmering by pushing the not too distant past away, opening up the future to the possibility of possibilities. They punctuate the flow of time by opening up a strict set of rules to the chance of failure. By pushing the process towards it's breaking point the image struggles to hold to the surface. This surface of performance, pride, mistakes, a semblance of constructed ideas can be investigated with fresh eyes again and again. Although documentary they seem personal, deserted by and separated from reality, they probe the murkiness of history and the subjectivity of recollection with a loose grip on the emotive and the unquantifiable. They play with the untrustworthiness and art of history. Pinhole has often been used to explain and explore photography by educators and amateurs or even scientists. lens–free and camera–free it is often thought to be a pure or honest form of image making – albeit with certain nerdy or even geeky attributes. 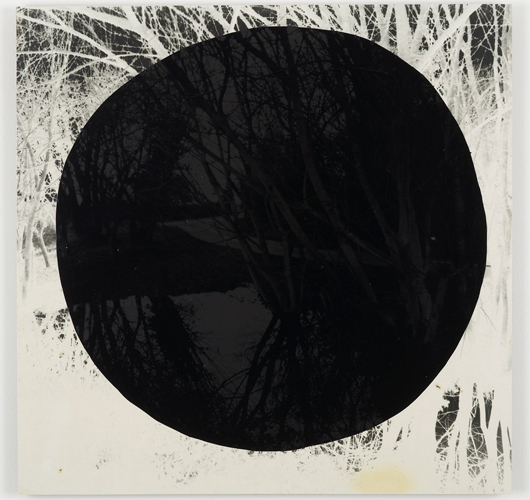 In recent years work by Zoe Leonard and Vera Lutter (two examples among others) has come to prominence – both working using pinhole photography in different ways to render beautiful photographs using this technique together with commercially available, professional photographic paper. Gates' practice which incorporates both working with found images and pinhole photography seeks to break both technique and possibilities down even further – and make a virtue of trial and error. It is not a question of returning to some historic position as pinhole has never been developed or used seriously as a technique in the history of photography. He appropriates aspects of physics and chemistry that are the fundamental tools of all photographic reproduction and combines image fixing techniques with light directed via a hole made by a pin. His subject could be said to be that which is often unseen or unnoticed albeit while being in full view, he plays at the border between the visible and invisible. Nothing is concocted, no sets are built, designed or constructed, everyday glamour being quite sufficient. Cardboard or glass is prepared with bitumen poured over it, this plate is then coated with a suspension of silver salts in gelatin; a light–tight receptacle – frequently but not necessarily or always a cardboard box is then built and the plate placed at the back, opposite a pin–hole of just the right size. The resulting photograph is thus both plate and positive image and thus unique, no edition or reprint being either possible or even of interest to this artist. The presence of light is as vital as its quality and both being ever–changing, exposures of 45 mins or longer (for example) are far from unusual. The Rural College of Art will be also be presenting 'Signature' a scored, unfolded, double–sided editioned lithograph limited to 74 copies by Andrew Curtis and David Gates. This continues a long standing collaboration between the two artists. Printed at the Curwen Studio, Cambridgeshire in offset litho, each print is stamped by The Rural College of Art, numbered by hand and available from domobaal (see link below), PayneShurvell, ART13 London, Qbox gallery, Athens and Wilson Chamber, Berlin. *We wish to draw particular attention to the fact that on Saturday 30 March the gallery itself will be closed and all the activity of the exhibition will take place in Essex. **C.A.R.T. (Contemporary Art Rural Tour): on the final day of the exhibition the gallery itself will close and the activity of the show will move to Essex – Wrabness and surroundings to be precise. The Rural College of Art will organise and host – for a strictly limited number of places only – a One Day M.R.A. (Fully Certified Master of Rural Art) – this will include a visit to the area which constitutes much of the College's studio. The Rural College of Art is open to everybody free of charge but places must be applied for and booked in advance and are strictly not transferable [apply by email] or [download The Rural College of Art application form as a Word doc].